An interstellar expedition, tracing an anomalous signal back to its origin. Three men on board a ship called the Fargo, all returning dead, two hundred years later, but with the cargo hold full of an unknown mineral that makes the fortune of the company that sent them into the unknown. Twenty-five years after that our story begins just before a ceremony to commemorate the adventures and the dead heroes. One journalist decides to dig a little deeper and finds out one of the men is still alive. 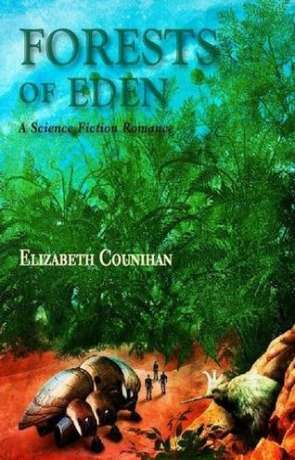 Forests of Eden by Elizabeth Counihan, is a sixty-page hard pack, published by PS Publishing in 2012. The story is a short novella first person narration. It follows Rufus O’Riordan as he tries to find the truth behind the story of the expedition and his subsequent journeys associated with doing so. On the cover, Counihan bills her work as a science fiction romance, which raises an expectation of the content during the reading, but towards the end, you see what is meant by that. Counihan’s short adventure is told in open and accessible prose. O’Riordan is a convincing narrator who’s varied personal circumstances are occasionally glossed over where they might have been expanded if the writer or publisher was looking to increase the word count. Counihan varies her use of him carefully. At times you get the sense of O’Riordan’s quest being a pawn in someone else’s game of corporate chess, but this theme is kept in check and facilitates the story, rather than overtaking it. When our journalist does find the truth, the revealed events are also recounted as a told story, keeping the narrative direct and tightly focused. The conclusion has a nice science fiction twist, living up to its subtitle. Such a romance could only exist in science fiction. Forests of Eden is a quick enjoyable evening’s read, occupying the book shelf as a rare genre novelette, which would be too long for any anthology or a magazine, as it would dominate any other companion works. The writing delivers an interesting and not immediately obvious plot, invoking a little of 1950s pulp mixed with into a more modern political background. There are no bumps in the road and its clear both writer and publisher are very aware of what they are doing with this work. Written on 13th March 2018 by Allen Stroud.